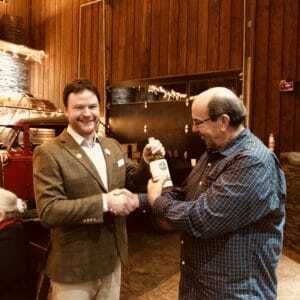 This blog is part of a new series highlighting the people behind Shelter Point Distillery. 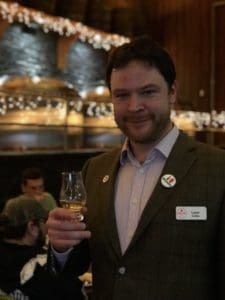 For this first entry, we speak with Leon Webb, Shelter Point’s newest distiller and the host of the new Shelter Point Whisky Club. You can find Leon snowboarding on Instagram or talking whisky on Twitter. SP: Your accent leaves no mystery behind your Scottish background… when did you arrive in Canada? Leon: I visited BC for the first time in 2000, after I met my future wife, Lydia, in Scotland in a student pub in Edinburgh. And I’ve just been coming back and forth ever since. When I finally moved to Canada to live and work in summer 2016, I became the Master Distiller at Victoria Distillers in Sidney. There I was distilling mostly gin, including the colour-changing gin, Empress 1908–quite innovative products. We were making rums, whiskies, a nice chocolate liqueur and bitters, so it was great to be creative across a range of spirits. But the whisky production was very small–we only had about 10 casks–and whisky’s always been what I’m most passionate about. So, when I left Victoria Distillers, Shelter Point Distillery was obviously top of my list for BC. In terms of whisky production, Shelter Point is far ahead of everyone else in the province, so to be here now is a real privilege. To be at the center of whisky in a new part of the whisky world. It’s quite a young industry here. In Scotland, I think the first mention of whisky was in 1494, so there’s a long track record there of whisky distilling. But in BC, the oldest craft distillery is only 14 years old. SP: You would say Shelter Point is ahead of the curve then? Leon: We have over 1000 casks in the warehouse here, I don’t think anyone else in BC is anywhere near that. When you’ve got that nice stock of whisky maturing, it allows you to do more in terms of putting whisky on the shelves and trying different expressions. Shelter Point is also continually producing the most whisky. There are a few other distilleries that maybe have the capacity to, but they’re not hammering the production day after day like we are. Many BC craft distilleries are multi-product ventures where they’re doing a wide range of spirits in small batches. Although we offer a range of vodkas and a liqueur at Shelter Point, Patrick [the owner], is very much whisky focused. 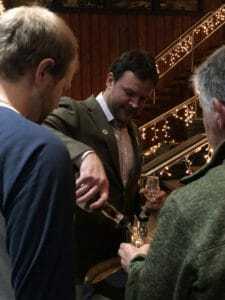 His vision for the future of BC whisky is something I’m very excited to be contributing to. SP: The large number of casks allow you to experiment and innovate as well? Leon: Exactly. You’ve got the two main influences: the spirit character that comes out of the distillery, and the effect of the wood. It’s how those two marry together and change over time that produces different styles of whisky. There’s a lot of good wineries in BC, so you can have fun maturing in different wine casks, and they all impart their own character and flavour to the spirit. We’ve got a great collection of different casks in the warehouse right now. We’ve got bourbon, rye, and some really nice red wine casks—high-end, locally sourced—that should introduce some nice flavours into the whisky if we play our cards right. The influence of the sea is also important here. Shelter Point is one of the last coastal farms on Vancouver Island—this is common in Scotland but rare in Western Canada. The sea air will impart a maritime character to the whisky, and I’m sure it’s going to be top notch in terms of flavour profiles. And hopefully it reflects the character of the area as well; it’s quite rugged and wild up here, but also has days like today, just calm, sunny, with a lot of subtle, stunning beauty. SP: Is that important to you then, that kind of character? place—that personality and character—whisky has that in abundance. You have to be patient with it; it’s not something you can make in a couple days like gin or vodka. It reflects provenance more than any other spirit. If you look at vodka and gin, they’re quite a narrow band of flavours. There can be complexity, but for me the depth of flavour in whisky is so much better. Sweetness, bitterness, creaminess, fruitiness, peatiness, or even umami when you have a seaweed influence in the whisky. In terms of that potential flavour spectrum, whisky is the most interesting spirit for me. SP: What’s the character of here—this farm and this distillery—that you want to bring to the whisky? Leon: For me it has to be rich, sweet, floral, and salty with a hint of smoke. Maybe a little bit citrusy as well. But one of the main things we can experiment with here that has never really been done in a BC distillery, or maybe even Canada, is sourcing local peat and making a nice, smoky, Canadian whisky. I grew up in Scotland with a peat fire, and I think the smell of peat is wonderful. It reflects provenance as well, because you’ve got different kinds of flora and fauna around the world. When it becomes peat, it’s reflecting the history of that place and the plants that were around it. So, when we use local peat here, it’s going to embody the environment of BC and Vancouver Island. That’s an important piece of the puzzle. SP: What’s that character like coming from Scotland to the west coast of Canada? Leon: I grew up in Aviemore right next to the mountains—quite a similar environment—and Scotland has that same kind of wild, stunning coast as well. Maybe you get nicer summers here, but the winter is wet, just like home. When I first met Lydia, it was actually because we both liked snowboarding. It was exciting to come to Canada and snowboard in places like Whistler and the local mountains of Vancouver. Yesterday I was up at Mount Washington and it was an absolutely stunning day. To be able to go from producing whisky to going snowboarding on the weekend is a dream come true. Here you just have that feeling of space, of wilderness, a sense of being here. I’ve seen bears on the farm, and the trumpeter swans coming down from Alaska and making lots of noise in the morning. It feels like you’re on the wild edge of North America. On the west coast of Scotland you get that same feeling as well. If you go to the Outer Hebrides, the next stop is Canada, you’re on the fringe of civilization. And I just kind of like these places. Everyone is so genuine and friendly. People work hard and persevere despite all the elements. I feel at home. 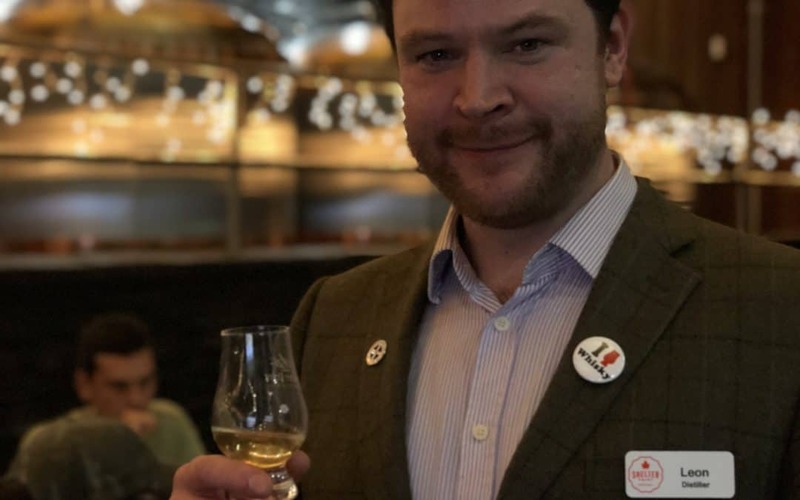 SP: Shelter Point has always had a kind of Scottish influence with its pot stills and scotch-style malted barley, are you going to bring more of that influence? Leon: Well, I’ve sort of brought the accent along, so we’ve got that down. Scotland is good at what they do, and they sell it all over the world. My vision for Shelter Point Distillery is to do the same but the BC version: With all the local elements, like the environment, the local wood, the local peat, I think it will be something unto its own that will be seen separately from Scotland. I don’t want to replicate Scotland in another part of the globe. In Canada, we aren’t overseen by the Scotch Whisky Association. They have very strict rules on the production of Scotch whisky. We don’t have that umbrella of rules. We have more room to try things differently and to innovate. I want Shelter Point whisky to be BC. I want to make excellent products that people here can be proud of, that showcase the best of Vancouver Island to the world.